“Variations on the theme” is apt terminology often used in music, but it’s equally appropriate in art. 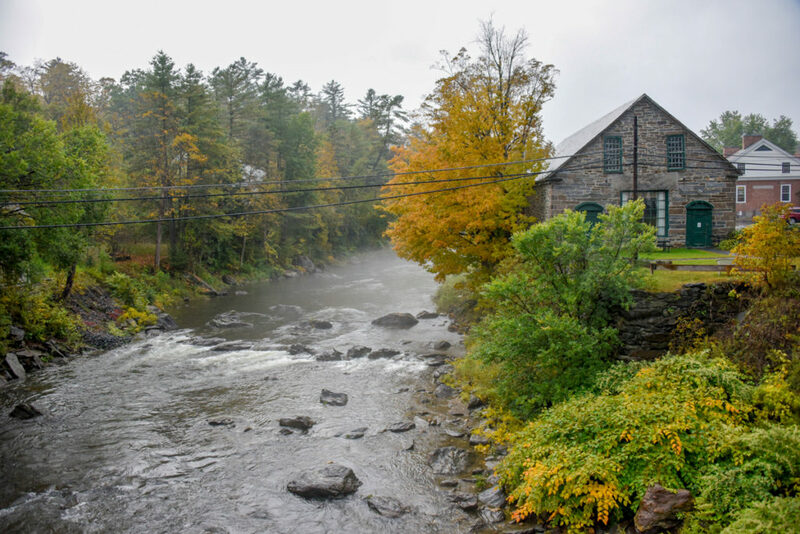 My recurring theme over the last week has been the Ottauquechee River. 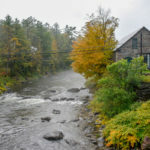 This Woodstock view exemplifies what I love about October… color, mood, and nature’s graceful transition. As an added bonus, I’ve also learned to spell it. 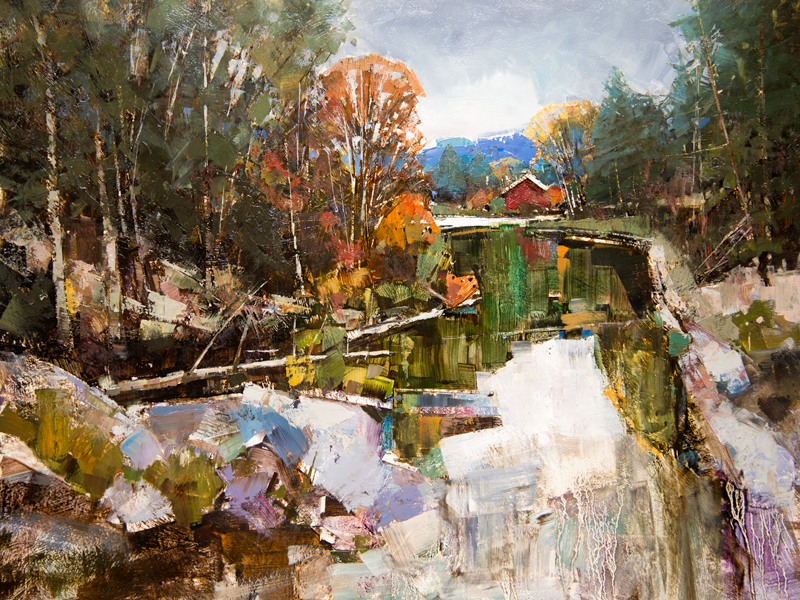 More recent Ottauquechee paintings below. Last week I was pleased to participate in the annual Vermont Institute of Natural Science (VINS) Plein Air Festival. It was great to meet and paint with some wonderful artists. The excellent raptor exhibit at the Quechee location is something everyone should see! “Ottauquechee Morning” 18X24 Oil on panel. This painting was awarded Best of Show. (Sold) This was painted from a bridge in the Village of Woodstock. I’m pretty skittish around heights, so this took some courage on my part to paint. 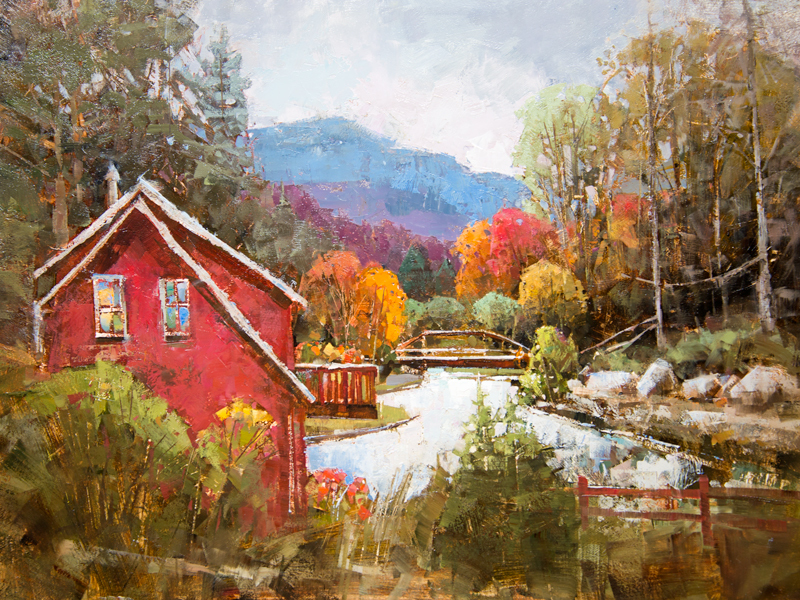 “Ottauquechee Afternoon” 18X24 Oil on panel. 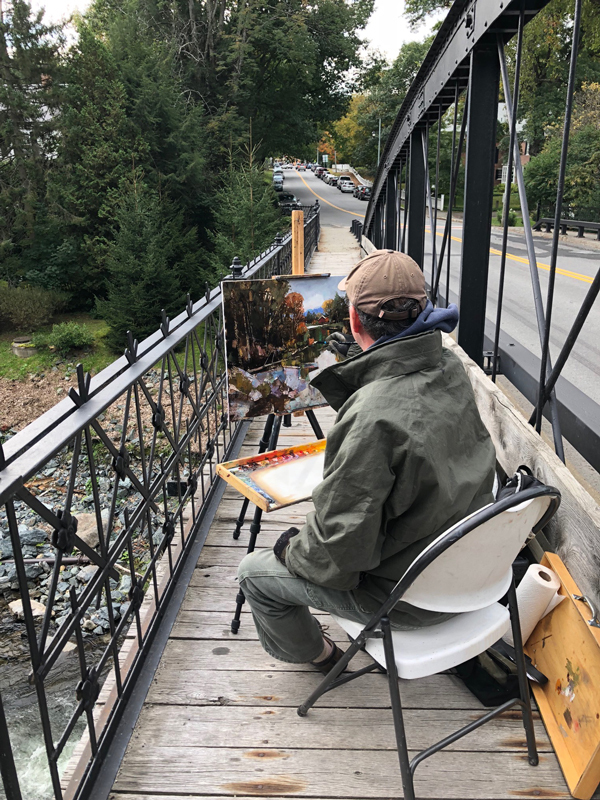 Another view in Woodstock, this one looking back at the bridge I painted from earlier in the day. This painting is now available. 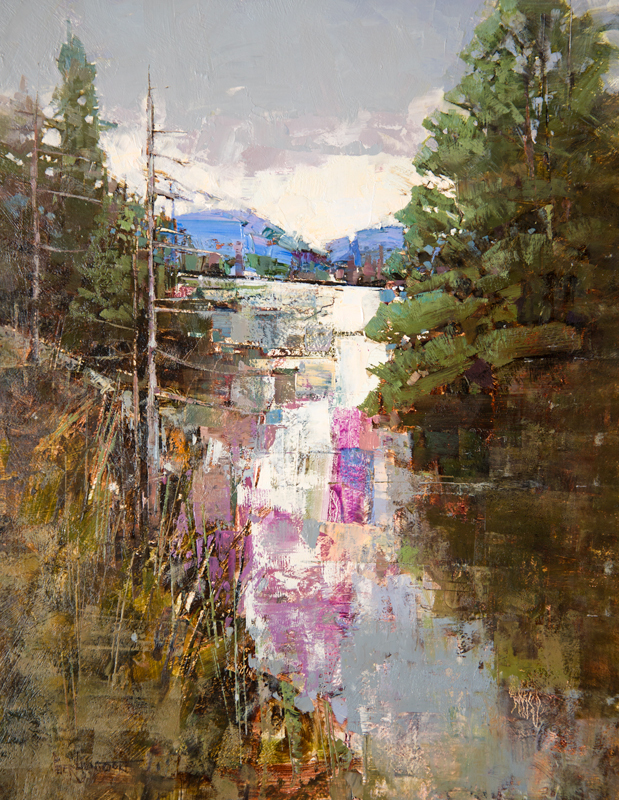 “Wilderness Waterway” 18X24 Oil on panel. This view (loosely) depicts the area where the Ottauquechee originates, at the foot of Killington Mountain. I started this painting a couple of weeks ago at the Sparkle Barn demonstration in Wallingford. I finished it Friday, but not in time to frame and bring to Art in The Park this past weekend. This painting is now available. The paintings are wonderful. You have a truly great talent! Brilliant photo of you painting that lovely Ottauquechee Morning picture. I hope the buyer got a copy of the photo, too. While these are gorgeous as separate paintings, what a beautiful series they make! I grew up in Maine so your paintings are so special to me. Sometimes I wish I had never left New England. I just received another of the prints (Forest Lake) and have taken it to the Art Shop to be framed. Stunning work! We were there in VT at this time last Oct. You have so much beauty in your state to be able to paint. Peter, you know I love your paintings. What is so special is your commentary. Yes, fall and/or autumn is nature’s gentle transformation. your beautiful paintings! Puts me right there. Thanks. The leaves of red and gold speak restlessly amongst themselves of warmer days and happy rays of sun, admiring themselves in mirrored crystal waters below. But, grays of clouds and somber stone whisper of soon to come November rains and chill. The essence of fall foliage in Vermont! 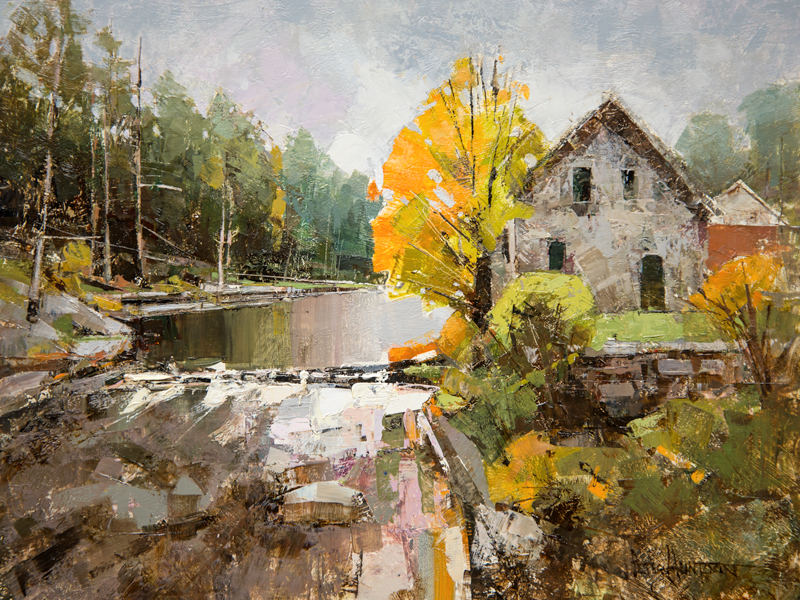 Hi Peter, your paintings are all beautiful and really capture the essence that is Vermont. I especially like wilderness waterways. Such colors, the pink splash really pops. I’ll experiment with more colors in my landscape watercolors now! Another beautiful painting.! if I ever win one, I would never be able to select one!